When Cardinal Casaroli was the Vatican Secretary of State, he sent a letter to the Rector of the Institut Catholique de Paris, then Archbishop Paul Poupard, praising the controversial Jesuit Fr. Teilhard de Chardin. This letter became famous as the "rehabilitation" of Teilhard, who had been suspect of heresy and barred from teaching, indirectly condemned by Pius XII's Encyclical Humani generis (n. 35). 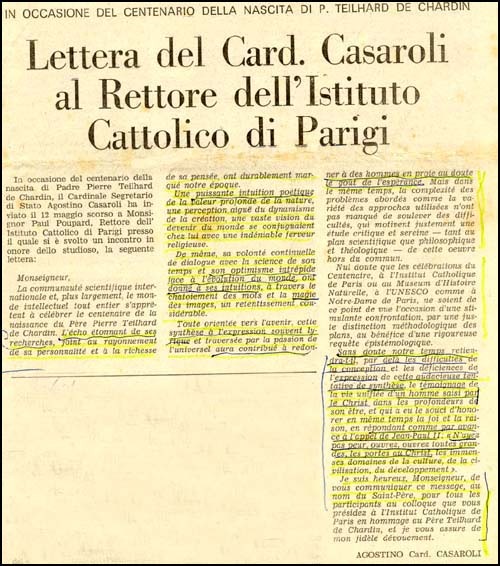 Casaroli sent this letter, dated May 12, 1981, to commemorate the 100th birthday anniversary of the French Jesuit, which was being celebrated at the Institut. 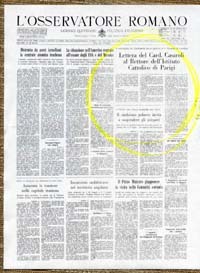 Casaroli wrote on behalf of John Paul II, as he noted at the end of the letter. Below, we reproduce a facsimile of the letter published on the front page of the Vatican organ L'Osservatore Romano. We translate the full text of the letter from French. "The international scientific community and, more generally, the entire intellectual world is preparing to celebrate the centennial of Fr. Teilhard de Chardin's birth. The astonishing resonance of his research, as well as the brilliance of his personality and richness of his thinking, have profoundly marked our epoch. "In him, a powerful poetic intuition of nature's profound value, a sharp perception of creation's dynanism, and a broad vision of the world's future join together with an incontestable religious fervor. "Similarly, his unremitting desire to dialogue with the science of his time and his bold optimism about the evolution of the world have given his intuitions - through the rich variety of his words and the magic of his images - considerable influence. "Completely turned to the future, this synthesis, often lyrical and animated with passion for the universal, will help to restore hope to those assailed by doubts. At the same time, the complexity of the problems he analyzed and the variety of approaches he adopted raised difficulties that understandably called for a calm, critical study - in the scientific, philosophical and theological realms - of his extraordinary work. "There can be no doubt that the celebrations of his 100th birthday - at the Catholic Institute of Paris, the Museum of Natural History, UNESCO, and Notre Dame of Paris - are an occasion for an encouraging evaluation [of his work] using a just methodological distinction of procedures in order to achieve a rigorous epistemological study. I am pleased, Monsignor, to communicate this message on behalf of the Holy Father to you and all the participants of the conference over which you are presiding at the Catholic Institute of Paris in homage to Fr. Teilhard de Chardin, and to assure you of my faithful allegiance.